This week’s special guest is Leo Notenboom of Ask Leo. Need a place to start for backing up your computer? Here’s Leo’s basic plan, with links to software. Here’s Leo’s video telling the story of the fire that took away much of his family history. 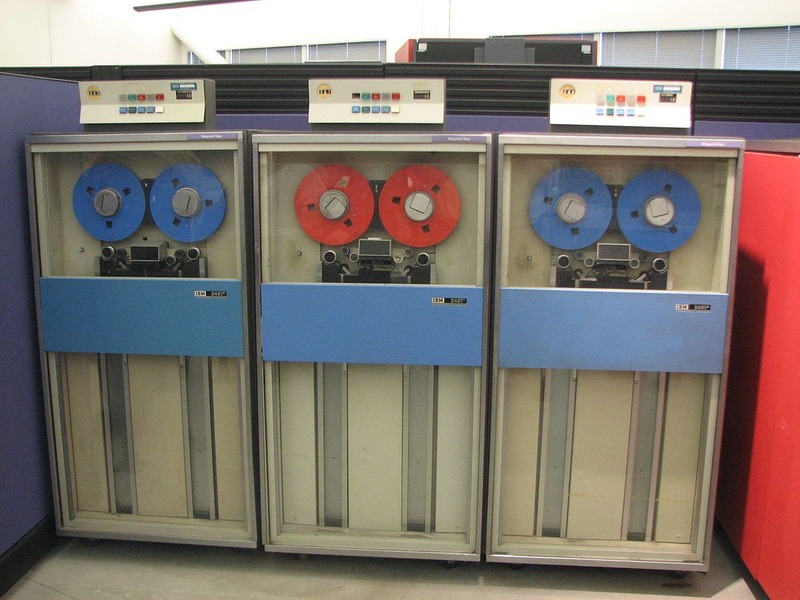 Typical 9 track tape drives, these made by IBM. Click to see larger. There is an ongoing project to save and recover the data from old 9 track tapes of data from the pre-Apollo moon probes in the 1960s. NASA wouldn’t do it, so former NASA employees got together and funded it themselves, bringing some spectacular results. That guilted NASA into throwing a few bucks their way to complete the job, which is how the Lunar Orbiter Image Recovery Project became an actual NASA program. The program has pretty much wound down, and their web site is still privately maintained: Moon Views. Wired ran a fascinating article and profile of LOIRP co-founder Keith Cowing; Cowing is a longtime friend of True, and once hosted this web site. The XKCD cartoon Leo refers to is called Digital Resource Lifespan. The one I thought he was referring to is Digital Data. The idea is indeed a common concern with tech types. After taking the “first season” of the podcast down for a revamp, there were certain episodes listeners said should still be available, so I’m redoing most of those. This is one of them, because it really fits the new theme, even though it starts with a tragedy, because it really is about Uncommon Sense — or, really, what people with Uncommon Sense realize, and do. What follows is an interview recorded in early November 2017. One note: I say in the recording that the Show Page is on the web site as Podcast 17. That was then, this is now: the Show Page is thisistrue.com/podcast20, where you can find a transcript, and a place to comment. With that, here we go. Randy: Welcome to Uncommon Sense, the Podcast companion to the ThisIsTrue.com newsletter with the mission to promote more thinking in the world. I’m Randy Cassingham, and this week I’m joined by a special guest: my old friend Leo Notenboom of AskLeo.com, which has the tagline “Making technology work for everyone.” Welcome, Leo. Randy: You’ll understand in a moment why I asked Leo to join us this week, because this week we’re discussing a story from issue 1220 of the newsletter, which will be included on the show Page at thisistrue.com/podcast17. It’s called “Wake-Up Call” — and you’ll see why I called it that in a moment, if you don’t already realize why. Leo: If there’s only one copy, it’s not backed up. Randy: And the story of losing the irreplaceable in a fire has special relevance for you, Leo, and is maybe rooted in something in your own history. Leo: Yeah, earlier this year I actually did a video podcast on this. When I was 9 years old, in 1966, there was a fire at my grandparents’ house back in the Netherlands. Now my parents had left the country in like 1952, something like that, and they didn’t take a lot with them, which meant that a lot of their heirlooms were in that house and in fact destroyed by the fire. In addition, I also learned actually just late last year that my grandfather was one of the first people in his area to actually take up photography as a hobby. Leo: …Which meant that a lot of his truly really old photographs were also lost in the fire. Photographs that were, not unlike these documents we’re talking about today, completely irreplaceable. Now one of the things that is most painful about the H-P story is that back in 1966, options for “backing up” photographs were limited. You would make additional prints maybe and store the negatives somewhere else perhaps, but it was a painful, painful process. Today, the documents that we’re talking about here for H-P, yeah: somebody could’ve invested in a scanner and taken the time to at least make digital copies of these documents. Admittedly, the fire would have destroyed the originals, and that’s another discussion to have, of course, but even just having a digital copy of something that important for the legacy that it represents is just— would have been a wonderful, wonderful opportunity and it represents really a second loss that the information here is just gone, period. Randy: Right, and even before scanners, they had Xerox machines even with document feeders that they could’ve just run stuff through. It’s sad that they lost the original papers, but they’ve also lost the information, and that’s just the real tragedy of all this. Leo: Exactly. It’s funny because one of the things that I’ve talked about on Ask Leo is why I prefer digital photography, because you can make a completely high fidelity, bit for bit, identical copy of any photograph you take in order to be able to back it up. Where if paper, with traditional photography, every print is a little different and once you scan it, you lose a little bit of the resolution. Yes, if they had taken the time to make a photocopy or scanned these documents, sure: the resolution wouldn’t have been as high quality as the original. I get that. But like you say, it’s the information that’s the biggest loss here, that there’s no way to recover. There’s no way to get it back. Randy: My tag line was a little bit sarcastic because H-P does of course have document scanners, and they’ve had them for many years. Why do you think they didn’t use them? Leo: That’s a really good question. I think that in a lot of ways— Well, for one things, this company that actually suffered the fire was now twice removed from H-P.
Leo: They were part of a company that H-P spun off and then, they were themselves spun off from that company. So perhaps the thinking that might’ve said, “Hey, our company makes scanners,” wasn’t part of the culture at the time. Honestly, I suspect it was more of a budget issue, that in doing things properly, yeah, it costs in one form or another. Certainly, a fireproof vault is more expensive than whatever it was they ended up putting it in, or having an archivist, which obviously is something that H-P did prioritize when the collection was part of, when the company was still part of them. Randy: Plus, an archival vault with a fire suppression system and all that. Leo: Yeah. Costs. And it’s unclear that this company would have been able to do that. Now somebody did make the comment in one of the reports on this that in reality, this entire collection should’ve been handed off to like Stanford. Leo: Or some other organization that’s actually tasked with, as part of their mission, preserving the important history of Silicon Valley. Again, it’s another opportunity lost, but that would’ve been the right solution probably in the long run. Randy: Yeah, it was the archivist herself, Ms. Lewis, that said the archives should’ve gone to Stanford where the founders were alumni. Randy: And that’s why so many of these companies, including Google, started up in Silicon Valley, ’cause they were Stanford students when they came up with their ideas. Leo: Exactly. Like I said, it’s a great loss, but from every loss, we all have this opportunity to learn a lesson and that’s where I tend to come from whenever I hear these stories. Randy: Which is why I invited you today. Leo: And I thank you very much for that! Everybody needs to hear my little mantra that if you only have one copy of something, or if there’s only an original copy of something, you run the risk of losing it. Anything can happen. Randy: I call this “Wake-Up Call” not just because big companies need to wake up and think about their own archives and how they’re protected, but I think it’s important for the individual, too, which is who you concentrate on. So talk about what kinds of things people have at risk that may not even realize it? Randy: And all their contacts. Leo: And all their contacts, all the correspondence, that can all be gone in an instant, unless you have a backup copy. Digital photographs are a nice segue here because it’s something that people at least understand they’re taking, and they do tend to be ephemeral, but the number of people I hear of that keep all of their photographs on their phone, and are completely heartbroken when they then lose the phone. Randy: Or they drop it and it breaks or something, yeah. Randy: Maybe, but not always. Randy: If it’s on a little chip that you can pull out of the phone and put into your computer, yes, but if the phone’s completely wrecked, maybe not. Leo: The issue, of course, is that if you lose the phone, none of those options are available to you and all of your photographs are gone. Randy: And why throw money at it when it’s really very simple to back up the pictures from your phone and your contact information and everything else. Leo: There are definitely many ways to do that. Now I’ll admit, I tend to overkill in the way I handle my own life just because it’s kind of the person I am and I keep seeing so many people lose so much data because they haven’t backed up. But when I take a photograph on my phone, within minutes, it’s been backed up to Dropbox or to Google Docs, or something like that. That then gets replicated to a number of computers here at home. Overnight, those then get replicated up to some more cloud storage. I kind of sort of go nuts with this stuff. Randy: You’re a backup fiend. Leo: I am. And the same is true with my SLR, with my digital SLR. Yes, for the time it takes me to copy the photographs from the camera to my computer, there’s only one copy, and I’m very, very cognizant of that fact when I’m in that situation, especially if I’m traveling. So I do make extra efforts to copy the photographs to my laptop, for example, if I’m on the road. And by copy, I really do mean copy: I don’t remove them from the camera until I’m certain that there’s another copy, and perhaps even another copy of that copy, safely in a couple of different locations. It’s not so much that it takes a lot of work. It’s more that it takes an awareness. It really takes people paying attention to, and prioritizing, and understanding the kind of things that that can be lost. Another thing people can do that they don’t do is simply back up their computer. I have a horrific story from, gosh, maybe four or five years ago, back when ransomware was first coming out, and we had a family, a friend of ours who had pictures of their grandchild that were encrypted. And unfortunately, the grandchild ended up passing away some years later, and all those pictures are still unrecoverable. They are gone. Had they had a backup prior to the ransomware kicking in, they could’ve restored everything from the backup, but nonetheless, it’s all gone. I actually still have that hard drive in my basement in the, by now, very small hope that some day that particular variant of ransomware will get cracked. I’m not holding up much hope for that, but you never know. Leo: But there’s so many things that can go wrong, especially with our digital data these days, that backing up is such a simple concept that it’s something that people really need to prioritize more than I think they already do. Randy: I actually have a story and This is True, fairly recently, that there was a fire and the guy’s wife or girlfriend called him up and said, “Hey, the house is on fire.” He raced home, arrived. Sure enough, the house is fully engulfed in flame, and rather than check to make sure his girlfriend’s OK, he ran straight into the house. Why? Because he never backed up his laptop, which had two different novels he was working on. Randy: And he had no other copies. Leo: Oh, yeah. Yep. I had years ago when I was first starting out with Ask Leo, I got email from somebody, a question from somebody, who essentially lost his nearly completed master’s thesis, because there was only one copy and I think the account got hacked or it got accidentally deleted. You can imagine the amount of information, the amount of value in the information we have today is incredible. It can be lost easily, but it can also be backed up trivially. I just hate to see people miss out on that. Randy: This goes back for me to the early days of digital data since I worked for the Jet Propulsion Laboratory, and they’re the ones that sent the probes to the moon prior to the moon landings, the probes to the other planets, etc. They got what they needed to get the moon landing done successfully by Neil Armstrong and his followers, but they didn’t actually fully process that data. 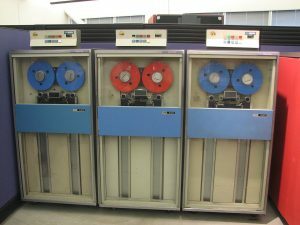 They just had them on these reels of 9 track tapes that use these big refrigerator-sized tape decks to read these digital tapes, and they don’t make those 9 track tape recorders anymore. They never went through all this data and processed it fully, and they have no backups. They didn’t spin this off onto more modern data formats so that they could look at it later, and a lot of that data was completely lost. Leo: That actually is one of the objections I sometimes get to keeping things in digital form is that the formats keep changing. Leo: In fact, there was just a recent XKCD comic that basically made fun of that as well. Randy: I’ll link to it. Leo: Yeah, there are a couple of things that I think we can count on for the long term, things like PDFs, things like JPEGs, they’re going to be around— the ability to decode them, to understand them is going to be around for a millennia. I honestly believe that. Randy: But not necessarily the format they’re recorded on. Randy: You could’ve put a JPEG on a 9 track tape, but if you don’t have a way to read that tape, you can’t decode that JPEG. Leo: Exactly. And today, for example, if I had something on a 3-1/2 inch floppy disk, I’d be hard pressed to come up with a way to read it, but I could, right. There are definitely ways to do so. It does require a certain amount of ongoing — I hesitate to call it maintenance — but again, it requires a little bit of awareness. Randy: And it really is maintenance. I mean if you know that your 5-1/4 floppies are going away, yeah, you got to re-record them onto 3-1/2 inch floppies. Randy: When they went away, then you got to put them onto something else. Leo: Yeah, that’s the nice thing about digital data, is making a copy of something is trivial, so do it while you can. Leo: I have, gosh, from my early years at Microsoft, I had some stuff that was burned onto CD-ROM. Well, that’s great. It was a good backup mechanism at the time, but CDs, especially the burnable kind, they have a life span. Leo: They tend to degrade over time. So some years ago, I took the time, a little bit of time, to sequentially copy each one of those CDs onto a hard disk. Now that hard disk, well, that hard disk has been copied and copied since then ’cause I’ve moved it from machine to machine, but that hard disk is actually now also part of the kinds of things that I back up automatically to the cloud. So that means that even if all my machines here at home were to somehow disappear, three or four Amazon data centers would all have to implode before I’d actually lose any data. Randy: Right, and those are probably geographically separated to different parts of the world so that it’s unlikely that they’ll all get wrecked at the same time. Leo: It is unlikely. And that’s actually one of the interesting thoughts I suppose about cloud storage. Again, people have concerns about cloud, using cloud services, of privacy and security and so forth, but the other side of the coin is that they’re handling the physical aspect of how this data gets stored. I honestly don’t care how the data gets stored as long as I can access it, and I’m sure that they’re constantly migrating things around to different hardware as hardware improves, and their systems scale, as the technology underlying them all changes. That all becomes pretty transparent to us because that’s their job. That’s what they do. They handle making that data available to me. Randy: So what’s your bottom line for a listener that maybe isn’t all that techie, and doesn’t have the hardware or software, and just wants to make sure that his correspondence, his baby pictures, his grandkids’ pictures are somehow saved? Randy: What software to use. Leo: Exactly. I have some step-by-step articles on exactly not just what software to use, but step by step walking you through actually using that software to perform the backups that I think are important. I understand that it can feel intimidating to a lot of people, and I think that once people understand that it’s really not as hard as it seems and that a lot of it, a lot of it, can just be automated. Computers are great at doing repetitive tasks under some limited instruction. This is an awesome opportunity for computers to do that, to do something automatically for you. Backing up your data is one of them. Randy: One thing when we first talked about this and having you on the show to talk about this, is that you wondered really, they didn’t scan it? How do you know? The source story that I used from the Santa Rosa Press-Democrat actually covered that. Brad Whitworth who was an HP international affairs manager with oversight of the archives 30 years ago said, “A huge piece of American business history is gone.” He said that Hewlett Packard had been at the forefront of an industry “that has radically changed the world.” So he basically thinks or knows that there isn’t a backup. There aren’t scans of these original papers. Leo: I would assume that if he’s saying something like that, that it’s literally gone, then yeah, there weren’t any backups. Randy: Right, and Karen Lewis, the archivist who I quoted in my version of the story said, “This could easily have been prevented and it’s a huge loss,” so she thinks it’s all gone, too. And Raymond Price, co-author of the 2009 book, “The H-P Phenomenon: Innovation and Business Transformation,” said that while he got limited access to the archives when researching the book in which they could’ve seen more, he says “we would’ve killed to have those records and to go through their personal papers since the archives contained such valuable insights into how companies grow. To me, it’s just tragic.” So pretty much people that are in the know are pretty assured that those were the only copies and that’s very sad. This is a high tech company that really ought to know better. Leo: As you point out in your comment on the story, it’s ultimately ironic just because what do I have downstairs? An H-P scanner. Leo: What am I using to scan the old photographs from my parents that I actually do still have to make sure that there’s more than one copy? H-P equipment. So it is ironic and I hope people learn a little bit from it. Randy: And I hope it’s a wake up call not just to big companies, but to everybody out there that doesn’t have their critical information backed up because as you say, Leo, if it’s only in one place, it’s not backed up and it could be lost. Randy: In addition to TRUE’s newsletter — you can subscribe at thisistrue.com — there’s a weekly Ask Leo newsletter too, which unsurprisingly you can find at askleo.com. And I’ll put a link to that on the Show Page. Thanks for joining us, Leo. Leo: Hey, thanks for having me, Randy! And we’re back to the present, episode 20. So there you go: people with Uncommon Sense understand that technology has its limits, and it’s ridiculously easy for a hard drive to crash, a computer or phone to get stolen, or a house — or a business — to burn down. If something is important to you — your digital photographs, scanned documents, the manuscript for your Great American Novel (or your thesis or dissertation! ), you need to take action now to protect it: back it up, and make sure there’s a copy of that backup somewhere else besides the location where the main copy is! Yet Leo frequently gets the question, how do I get this only copy of “whatever” back? Very often, they can’t. It’s something to think about. Again, the Show Page for this episode, which has a transcript, is thisistrue.com/podcast20, which is also the place you can comment. Where do you want us to put all this? I don’t know, looks like just some papers & stuff. OK, then just put it in that bldg. over there. The after-the-fact platitudes from Keysight Technologies make me think that they just never bothered to take the time to figure out what was in all those boxes. They just assumed it wasn’t anything important or anything that needed special protection/preservation. Keysight is about 1/2 mile from my house. As you probably saw from overhead shots of the facility, those modular buildings were the only structures on the campus that burned down. The original curator of that collection in the 80s was both livid and heartbroken that somehow the last home of these documents could not be bothered to keep them in a fire-safe fire safe, as it had been prior to ending up at Agilent/Keysight. Just awful. Being evacuated 3 times in one week has put making a cloud backup plan as suggested in this podcast a much higher priority. Due to years assisting an archivist during one of my alternate lifelines, this story hurt immensely. Techies especially but everyone, backup! store! maintain the paper & electronic trails for us historians! I think Jeff is covering his arse with that last comment. I guess he’s hoping by the time it comes to check whats left and blame to be apportioned he will have ridden off into the sunset with a golden handshake. Many years ago, I met a man who was a linguist and missionary in Vietnam beginning before the war started. When he and his family were forced to evacuate by the North towards the end of the war, a small suitcase with all their research was the only thing they took. They were moved from place to place, and were finally allowed to leave. But before going on the plane, had to give up the suitcase. So they had to recreate 20 years of research with the help of Vietnamese expatriates in the states. (This was before personal computers.) Another acquaintance backed up all his work to floppies (this in the 80s), but they were still in the house when it caught fire. Cloud storage is a perfect solution. And I’m lousy/lazy about doing it! Years ago I worked for a tech company. One day the server crashed. IT Response: No problem, we do weekly full backups and daily incremental backups. IT: The daily restore of the server failed. No problem, we’ll restore the last full backup. IT: Damn, the full backup failed. IT: Damn, the previous backup failed. IT: Double Dang, the last monthly failed. IT: ALL the backups don’t work — over two years. Moral: Don’t JUST backup, TEST your backups — can you restore from them? In the end the entire R&D and QA staff had to re-invent the product from scratch, and wound up writing a tighter faster more efficient product that did well in the market. For years I taught about operating systems including the importance of backups. Practicing what I preach, I’ve backed up from 5 1/2 to 3 1/4 to CDs to DVDs to SD cards. Now I need to find an Apple II+ that can read an SD card so I can run those programs I wrote in the 70s. But thanks for the reminder. While I have digitized all the pictures, newspaper articles, letters I have inherited, I haven’t done the same for all my own old snapshots. I guess I know what I will be doing for the next month. If you have a windows machine, find the ciderpress program to go through your Apple II archive. Your podcast on backing up family records was stimulating. I am now investigating digitising my boxes of records and photos. The practical issue of doing so is daunting. The material is of various kinds including multiple sheets stapled together, small bound documents, photos, 35 mm slides, 2” slides and a few negatives. I don’t think my standard scanner (HP Officejet 8630), which is fine for routine scanning, is versatile enough to do the job. Moreover the software for saving in Windows 10 is quite clunky. I expect to have to enter a name for every item scanned. But I would prefer not to have multiple clicks to transfer each of a series of scans destined for the same archive folder. Can you please advise the most practical hardware and software, and a good guide to such archiving? Thank you for all your assistance over the years. How can documents and photos be worth that amount of money? It is just history. It is old news and old history about a company that has surpassed that old technology. Therefore, where is the value? Would they really need to go back and reinvent old HP? And for what purpose? I don’t see that value and who put that figure of $1.9M on them? Perhaps the value in man hours to attain the old knowledge but certainly not in the actual value of the paperwork. Thanks Gary. I do know where there is a working Apple II+, mine. I donated it to a museum over 25 years ago. Now the question becomes, do I ready want to see the “super cool” programs I wrote back in misspent youth. 😉 I’ll check with the museum and see if they are interested. Thanks again. The biggest problem I have is my hard drive keeps getting larger, and the size of the flash drives I back up to is not keeping pace. Yes, backing up to the cloud is an easy option — but much of my data is actually business records for clients which contain extensive personal confidential data — I am an income tax preparer and have all that data locked into my computer and backed up onto flash drives stored elsewhere. After everyone from Equifax on up and down getting hacked, I just do not feel comfortable putting this kind of data on the cloud. Personal data and photos, however, are of course a different matter. Yes, you do have particular requirements (ethical, if not statutory!) to carefully protect such client data. You definitely can use cloud backups for that, though: you just have to encrypt it well first — something Equifax didn’t bother with (the bastards!) The “how” is beyond the scope of this site, but I’m sure exploring a bit on Ask Leo would help. This really pissed me off — they moved everything from a fireproof, controlled environment to a shed. I will not buy any equipment from that company ever again. Another kind of back-up is List Moderators. I ran a couple Yahoo groups a while back and lost them when my account disappeared (long story). I was the only person who was a list moderator. When I recreated the groups, I made two other people co-moderators “just in case” something happened to my account again. Since then, I have been a strong advocate of co-moderators on any Yahoo group or other on-line forum. I also run a couple pages on Facebook and have co-moderators there, too, since profiles have a bad habit of disappearing. That way, the list doesn’t die and I can get one of my backup mods to reauthorize me if I have to start a new account. I’m somewhat lax about saving my photos, but have most of them on my computer, an external drive, and a flash drive. I have some older stuff on CD so I need to find those and probably make new backups. I’ve considered another external drive since mine crashed a couple years ago The data recovery guys were able to salvage almost everything, thank goodness. My dad had a lot of photos on 3 1/2 inch floppies that I was able to transfer to my computer. I also backed up everything on his Mac to my PC after he passed away. I’m still scanning a lot of my mom’s photos, though.